Arrrr Matey's! It aint beneath ourselves to take advantage of International Talk Like A Pirate Day! It be a real holiday! See fer y'self here. What do pirates and Bigfoot be havin' in common? You'll be findin' the answer at Slow Wave. Slow Wave is a collective dream diary authored by different people from around the world, edited and drawn as a comic strip by Jesse Reklaw. A new strip is uploaded every week. Below is an dream from 2007. 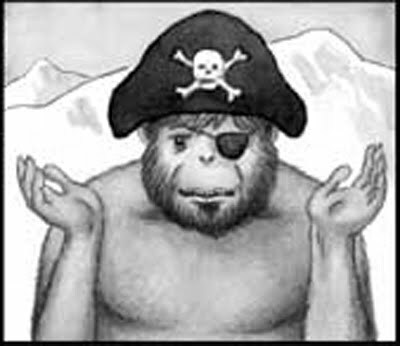 I wonder if any pirates every ran across any Bigfoot in the old days. Stories of vikings and conquistadors seeing hair man tribes have been told. Now thats a movie plot, Black Beard Vs. Sasquatch. You heard it here first. Oh ya, Rrrr you Salty Seabiscut. Pirates vs. Bigfoot be a grand idea. Some scalleywag should make that movie or walk the plank.